There is a weekly collection -- Waste one Week and Recyclables on the other week. Your brown bin is also collected on alternate weeks but it may be a different collection day. You will be told your Collection Day when you order your Wheelie Bins. Please leave your bins out for collection the night before to ensure collection. This option is guided towards households with families and young children. 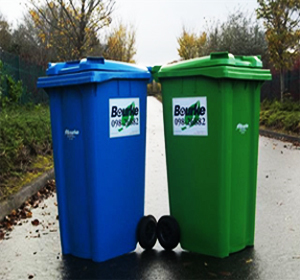 We provide you with a Blue & Green Bin for Waste and recycling and for a fee ( Quote in Office) this provides for our services for 6 months with a Max Waste Allowance of 650 kgs. If you go over this allowance , you will be billed an additional fee per kg for every kilo over 650 kgs on your next invoice. However this allowance is generous and should cater for most customer needs. You will be able to check your weights on our New Household Web Portal . To gain access you will need your account number and pin number which will be available at the top , right hand corner of your invoice. This option is guided towards the lighter user and with this option , you are paying for exactly for the waste you produce. There are 3 parts to the Invoice. Customers can control their waste costs with this system and with the use of our New Web Portal you can check the weights of your bins in order to get the best possible results. In order to assist our customers choose the best option financially, customers can login to your Account here. You will need your account number and pin number ( printed on your invoice). This will give you access to your account where you can view your transactions, check your monthly weights, view your recycling graph and you can also pay your bill.